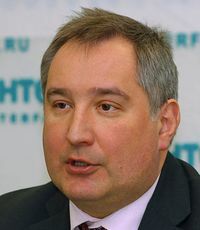 Russian Deputy Prime Minister Dmitry Rogozin believes that Russia should by no means seek competition with Elon Musk and his company SpaceX on the market of launch vehicles, because this segment constitutes a tiny 4% of the overall market of space services. “The share of launch vehicles is as small as 4% percent of the overall market of space services. The 4% stake isn’t worth the effort to try to elbow Musk and China aside,” Rogozin said in an interview on the RBC-TV channel on Tuesday. TASS also reports that Rogozin believes that Russia should concentrate on satellite manufacturing, which is where the real money is. That raises the question, how good exactly are the Russians at building satellites? Do they have the technology and skilled workers to compete? What he is not paying attention to, is that SX is building an automated manufacturing line for SATs so as to do for SATs, what musk has done for rockets and EVs. And one-web and others will likely do the same. Recent history shows us Russia isn’t the best satellite manufacturer… They are also fudging the numbers Russian launch vehicles represent 4% of the market launch represents roughly 25% of the industry. I wonder what the market for Russian trampolines is..
Let’s hope that the Starlink assembly line has fewer problems than the Tesla Model 3 assembly line. The FCC has set a hard deadline for SpaceX. They can’t let the schedule slip nearly as much as Tesla did for the Model 3. 6 months behind? That is not much slippage esp when you realize that it takes other car makers 2 years to get to 125k cars/year. I assume they just won’t try to compete for commercial launches. They still need launchers to put their spy sats up, and I doubt they will stop space exploration. Would they build a Soyuz capsule, and ask the Chinese to launch their cosmonauts into space ? I think not. It’s about money and graft, they also have yet to put something on Mars in tact. God, I hope that we do not end up with duopoly. Trading a monopoly of ula for just 2 other companies would make it just as bad. We need to build up space travel and that pretty much means private space states AND private bases on the moon. Esp the later. Dauria Aerospace, a Russian NewSpace satellite maker, was summarily expropriated from its entrepreneurial founders and handed to one of Putin’s pet oligarchs a couple years back. My guess is this new talk about satellites prioritized over launchers is based on said oligarch wanting to capitalize further on his gift. I predict Russian satellites will find few takers outside Russia. I am not surprised that Russia is giving up. They neither the money nor technological base to compete with SpaceX or Blue Origin. There only advantage was a low cost workforce and simple rugged legacy launch systems. Yes, you will have the big airlines with their jumbo jets and the small private bush pilots for options. Yes, they will need to keep flying so they continue to look like a super power in space. But I wonder how long they will be able to do so without becoming an international joke when BFR is delivering a 100 vacationers a week to the lunar and orbital hotels for low gravity sports and recreation. I must remind you, Mr Messier, that Russia has made satellites for over 60 years…For the first 10 of those 60 years, I admit, Russian satellites had a small advantage over America’s in their larger size. Admittedly, most of those early Russian/Soviet satellites were primitive compared to their American counterparts; Russian satellites in the 50’s and much of the 60’s often used vacuum tubes. But starting under the Brezhnev era, Soviet satellites evolved to incorporate transistors, then integrated circuits. and finally by the time Gorbachev was in power, Russian satellites were beginning to use micro-circuits, improved solar-panels, improved inertial-guidance/orientation systems…..So can Russia make satellites today?…The answer is YES YES YES!!!! Brought a knife to a gun fight.. Yes, Russia can make satellites. They can even make them as fast, and cheaper, than the craft shop approach still in use here. The question is whether they can industrialize satellite production in the same way that StarLink will be doing. The changes that are driving Russian launchers from the worldwide networks of sales are going to be repeated in the networks for selling satellites. Those changes are, at their core, moving from political allocation of resources to market allocation of resources. Can Russia do *that??? * is the big question. The question is, does vodka make for good on-orbit RCS propellant? Provided an oxidizer high purity alcohol makes for a somewhat decent propellant, it was more comon before RP-1 became the go to. They do have the technological skills for it. Just not the money. All one has to do is look at their ICBMs and MARV technology to see they could do it. It just requires too much investment for their taste. Russians like to invest in themselves even less than Americans do. Keep in mind the kind of investment we see in the US is a pretty recent set of events started by Musk and Bezos. ULA is doing it kicking and screaming. To their credit OATK shows no open debates between the corporate board and the project head as we see with ULA and Vulcan. How could they not give up after the Angara mess and the way they’ve defiled Proton? They have been proposing it since the turn of the century by it never seems to go beyond a mockup and drawings, like a lot of their tech. I believe it when it is actually flying. And they have also been building jet airliners as long, although few consider them as competition to Boeing and AIrbus. But the Ukraine was their source of ICBM talent. Boosters (other than Zenit) were made in Russia. At least that was my understanding. I know the Soyuz capsule and service module had a lot of parts from Ukraine. I guess you could argue that the talent pool had to be diverted from Russian launch vehicles to Russian ICBMs. Putin has been complaining in public about failures in the space sector. He may have just given up. If so, that’s a problem with a nation of one. This could also be a “We’re pulling out of Syria” moment. Where, they don’t. Baikal goes back to the early 90’s. It was supposed to be part of the Energya system. and the small private bush pilots for options. That doesn’t make much sense. Bush planes and regional commuter jets exist because those routes lack the demand for larger aircraft. Earth-launch is the primary route to space. The first step to everywhere. If there’s enough demand (eventually) to support a launcher the size and expected launch frequency as BFR, then no small launcher can compete. Depends on what orbits you want to send payloads to, just as taking a B737 or hiring a Bush Pilot depends on where you want to fly. That said the demand for mini-launchers is going to be sparse once BFR gets going. The Russians, like the Soviets before them, have no trouble spending all they can on weaponry – when they have the money. As you correctly note, they no longer have the money. Lost in the recent Russian sabre-rattling anent their “new” heavy ICBM, the RS-28 Sarmat, was that Russia only intends to deploy 50 of these beasts. The RS-28’s predecessor, the SS-18 (RS-36) numbered over 300 deployments during Soviet times. Only about 50 of these are left and the Sarmat will be replacing them, one at a time, starting in 2020 – assuming no additional program delays. Russia simply can’t afford nearly as much weaponry as the old Soviet Union could. So when, or even whether, Russia ever gets 50 Sarmats in the ground is still, IMHO, very much an open question. This increasing penury affects every other Russian government account as well. Russia lacks money to build modern, competitive, reusable launch vehicles. The end of Russian commercial launch activity will pinch the remainder of the Russian space program proportionally harder than even the military because, up until recently, it was substantially self-funding. The end of engine sales to U.S. launch providers over the next five or six years will increase the strain. Except for its own national security stuff, Russia will be launching pretty much nothing by the early to mid-2020’s. And those launches will all be on legacy rockets. In terms of spiking Russian military and space power, SpaceX has been worth as much as an all out assault by up to half of the old Strategic Air Command. And SpaceX has achieved this result as a byproduct and with far less mess. Yes. The quantity of pie-in-the-sky-bye-and-bye braggadocio churned out by the Russian military and space apparat seems to be pretty much in inverse proportion to actual accomplishments. Which entities in what other countries do you see as potential competitors to BFR-BFS and New Armstrong? Myself, I can’t see any likely candidates. right now none, later, whomever has enough money and will, plain and simple. Smallsat makers are, almost by definition, not going to spend an order of magnitude more for launch instead of working around existing delivery routes. If BFR gets within a factor of 3 of its expected launch price (and SpaceX has been good at predicting their launch prices) then it’ll be maybe ten times the cost of a fully reusable mini-launcher, the per-kg cost for tertiary (sub-1t) payloads will be 10% of mini-launchers. Like a lot of current development, they are essentially banking on SpaceX failing, and things going back to how they were. It’s meaningless to talk about New Armstrong. We have nothing other than Bezos mentioning the name once. Okay, got it. You’re figuring it’s Musk, Bezos and a draft pick to be named later. Problem is, there are no other likely players in Musk’s and Bezos’s league. The Russians and Europeans sure aren’t going to play at that level. The Chinese – at least for now – maybe have the money, but any new project equivalent to BFR-BFS or New Armstrong is going to take them a lot longer to gin up from scratch than it will take SpaceX and Blue Origin to do theirs. By then, SpaceX and Blue will be established players and China is likely to have more urgent priority calls on all that money. I think he’s mentioned it a bit more than that. But progress is not equivalent to publicity. Blue has, historically, played its cards much closer to the vest than even most other NewSpace companies. We’ll hear more about New Armstrong when Blue is ready to say more. Reality is unaffected by the presence or absence of any given size pile of press releases. I think he’s mentioned it a bit more than that. Dictators have always tended toward overreach and miscalculation. Comes with believing one’s own hype. Putin is very normative in that regard. I think Rogozin’s statement is just a way to try spinning a necessity – acknowledging abject defeat in the commercial launch market – into something that at least superficially resembles a virtue. As W.C. Fields once said, “Ah, look over there… a buffalo stampede.” It’s misdirection. When the glorious future victory in the satellite construction market also fails to materialize, there will be another feel-good story ready to go. It’s how these people roll. I commend to your attention pretty much any official communication of the Japanese Imperial Government during the last two years of WW2. Always great victories reported. And every one of them was located closer and closer to the home islands. The way i see it, it will either be someone already in the space industry piggybacking off of security needs, or someone who makes it big in an outside industry, it could also be the result of a merger between small launchers and at least one conventionally sized player. I like your comparison of the effects of SX to what LeMay’s SAC intended to do to the Soviet Strategic Rocket Forces. I have a similar admiration for the Chinese and their ability to wipe out the American industrial base writ large. From what I can see R-28 is a Russian R-36. R-36 was a product of Ukraine. My bet is they use the same silo and same command pods. I laughed when they paraded out FROBS as if it were something new. Then as now ignoring the fact that the US has total global live IR imaging of anything ascending, reentering, and bursting. Small and medium lifters will have 4 advantages, so long as they are reusable to help manage price, availability, privacy, dedicated launch, and spacecraft propulsion options. Edit no other country will allow the only major launch players to be in the US or at least not every other space power. Yes, and annexation of Crimmia was a major miscalculation, and as with all governments, dictatorships are only as strong as the governed are willing to support them, there’s just a greater disconnect to that fact.